Mid-Pitch Banhu crafted by Beijing Maker, Man Ruixing. 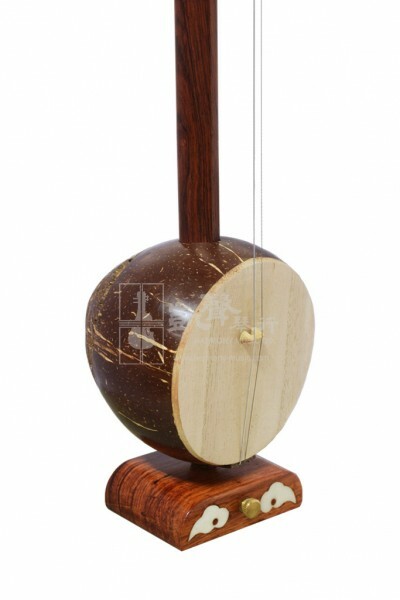 Having won numerous awards from the Ministry of Culture of People's Republic of China, Man Ruixing created this Rosewood Banhu with a natural coconut shell sound box. The Banhu head is then decorated with an elegant sculpted tree peony. With crisp and resonant sounds, as well as demonstrating quick response, this Banhu can easily be the star player for bold, passionate melodies and Northern Chinese Opera. This Beijing Rosewood Mid-Pitch Banhu by Man Ruixing is well-accessorized with a bow, a spare string set and bridge, a rosin and a case.